Looking for a extra long-lasting mobile phone to let you stay connected wherever you are? 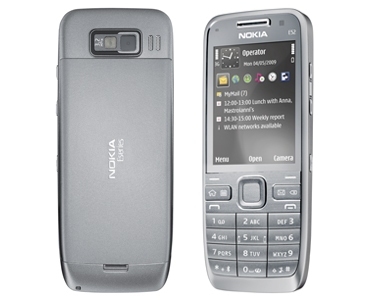 Nokia has coming up with something to meet consumers’ need with its brand new Nokia E52, which the company claims can support up to 8 hours of talk time or 23 days of standby time, featuring 3.2-megapixel camera, 2.4-inch (240 x 320 pixels) QVGA screen, A-GPS, built-in mobile VPN, Call Connect, high-speed HSDPA (10.2Mb per second), HSUPA (up to 2Mb per second) connections and noise cancellation aiming for excellent talk quality. The new compact Nokia E52 cellphone that comes bundled with a 1GB microSD card is scheduled to be available by the second half of this year for about €245.